One week on from the UNCLOS arbitration ruling on the South China Sea, the PRC’s response continues to somehow both clarify and complicate the issue at the same time. The latest episode in the unfolding mystery of the nine-dash line seems to diminish the line’s linkage with oil and gas claims designated unlawful by the Tribunal, while ramping up its associations with “historic title” over large sweeps of archipelagic waters [but seemingly not the entire Spratly archipelago – see update at the bottom]. The article offers a more complex clarification of the line’s meaning than my optimistic reading of last week’s PRC Government Statement: whereas i read the Statement as implicitly separating the nine-dash line from China’s maritime rights claims, this article spells out at least some explicit links between the two. On the other hand, it offers little or no support to the expansionist reading of the line that has underpinned many provocative PRC actions in recent years. In particular, the CPS scholars’ definition does not appear to support a claim to oil and gas resources out to the edge of the nine-dash line. This was a key element of the implied reading of the nine-dash line that the Tribunal struck down as unlawful. It’s a position that the PRC has backed up with coercion against other claimants’ energy survey ships in the past, and it’s also the basis for the notion, widespread in PRC domestic discourse, that rival claimants, especially Vietnam and Malaysia, are “plundering” China’s resources. 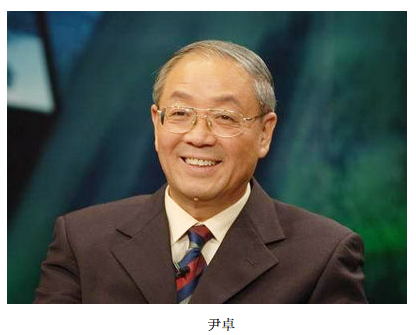 The writing of this article is attributed to CPS Postgraduate Studies Institute Deputy Dean Wang Junmin 王军敏, but the newspaper byline attributes it collectively to the CPS Center for Research on the Theoretical System of Socialism With Chinese Characteristics. It is, as such, not a government statement, but it’s very detailed, takes into account the Tribunal ruling, and could end up being close to the interpretation the PRC goes forward with in the wake of the ruling. The author(s) state that the Philippines “distorted” the nine-dash line by (a) presenting it to the arbitral tribunal as representing a Chinese claim to sovereign rights and administration over all of the waters and seabed within; and (b) by arguing that the PRC claims “historic rights” (历史性权利) within the line, when in fact the PRC claims “historic title” (历史性所有权) over areas within the line, putting the case outside the Tribunal’s jurisdiction. This line of argument appeared, fleetingly, in China’s 2014 Position Paper, which noted that disputes concerning “historic bays or titles” were exempt from compulsory dispute resolution under Article 298. 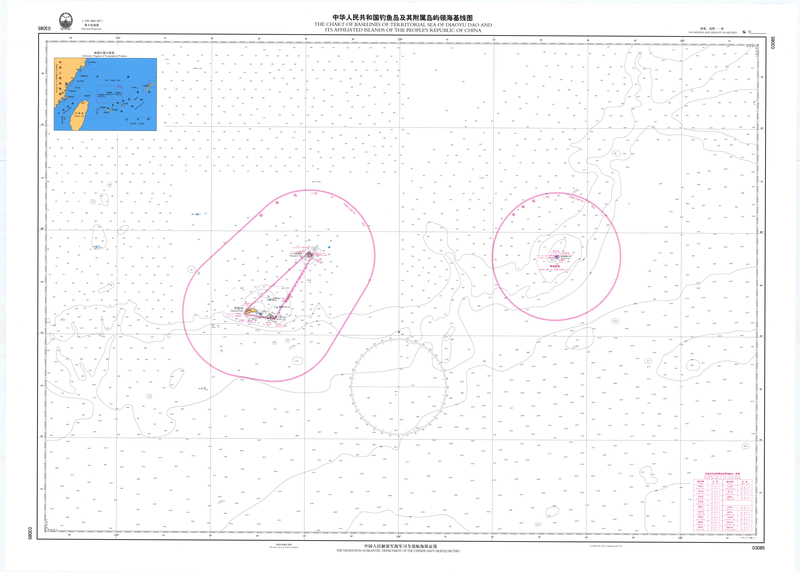 According to the author(s), China has “historic title” to internal waters within archipelagic straight baselines. First, looking at China’s practical exercise of state power, China has never claimed all the waters within the line as its territorial sea or internal waters, exercising state sovereignty there. In fact, the 1958 Territorial Sea Declaration, at the same time as proclaiming the applicability of the straight baseline system and setting the breadth of China’s territorial seas at 12nm, implicitly noted that international waters [exist] between the Chinese mainland and coastal islands, and Taiwan and surrounding islands, Penghu, Pratas, Paracels, Zhongsha, Spratlys and other islands belonging to China [ZH]. In 1996 the Declaration of Territorial Sea Baselines announced the territorial sea basepoints and baselines for the Paracel Islands, thereby implying that within the ‘nine-dash line’ China would, in accordance with the UNCLOS, take the Paracels as an integrated whole entitled to territorial seas, contiguous zone, EEZ and continental shelf. Likewise, China’s 2011 note to the UN Secretary General claimed that the Spratlys also enjoy territorial seas, EEZ and continental shelf. This implies: China has never claimed all the waters within the ‘nine-dash line’ as China’s historic waters or that it enjoys historic rights . Second, the Philippines used the Chinese expression ‘historic rights’ (历史性权利) to argue China had not claimed ‘historic title’ (历史性所有权). As everyone knows, historic rights in international law refers to the rights enjoyed continuously by a state in certain waters since ancient times. Historic rights include historic title and non-exclusive historic rights. Waters subject to historic title are called ‘historic waters’ (历史性水域), these are part of a coastal state’s internal waters or territorial seas, and mainly include historic bays. other coastal waters adjacent to the coast, and the waters within archipelagos. Non-exclusive historic rights are divided into historic rights of passage and historic fishing rights. The former refers to innocent passage through internal waters, specifically all countries’ rights of innocent passage through areas not originally regarded as internal waters, but which became enclosed as such through the coastal state’s application of straight baselines. [ZH] The latter refers to non-exclusive rights to fish in areas that were previously fished in accordance with high seas freedoms but which have now become a coastal state’s EEZ [or] archipelagic waters. [ZH] The mere use of ‘historic rights’ in the PRC EEZ and Continental Shelf Law, by MFA spokespersons, and by Chinese scholars, does not imply China does not claim ‘historic title’. In fact, our country has historic title and historic fishing rights in different areas within the nine-dash line. Third, China’s ‘nine-dash line’ rights claims mainly comprise: 1. China has territorial sovereignty over islands, reefs, cays and shoals within the line; 2. China has historic title to waters within archipelagos or island groups that are at relatively close distance and that can be viewed as an integrated whole, these areas are China’s historic waters, they are our country’s internal waters,[ZH] and China has the right to draw straight baselines around the outermost points of these waters and claim state administrative zones such as territorial seas, EEZs and continental shelves etc. in accordance with the UNCLOS. 3. When waters within the ‘nine-dash line’ become [part of] another country’s EEZ or an archipelagic state’s waters, China has the right to claim historic fishing rights or traditional fishing rights in the overlapping areas. The many references to non-exclusive fishing rights contrast sharply with the complete absence of any mention of claims to oil and gas rights. As noted, it was precisely that (implied) claim that led to the line being designated unlawful. The 2012 CNOOC oil blocks, especially, convinced the Tribunal that China was acting in accordance with this reading of the line (see especially the Award paragraphs 208-214). But under the above definition, the nine-dash line seems to have no significance at all to the geographic scope of China’s energy rights claims. The other striking thing about this definition is the heavy focus on the issue of historic title over internal waters enclosed within straight baselines around island groups — an issue addressed in an excellent article by Yanmei Xie over the weekend. There is plenty of reason to think that straight baselines might be about to enclose the Spratlys, a move that would significantly harden the PRC’s position. But there might be yet another strange twist here. Looking again at the third paragraph above, the Party School authors define China’s claim of historic title to internal waters as existing in “archipelagos or island groups that are at a relatively close distance and that can be viewed as an integrated whole (my emphasis).” Which kinda seems to suggest the historic title aspect might be referring to the Paracels but not the Spratlys. I’ve heard the “can be viewed as an integrated whole” argument for archipelagic straight baselines in the South China Sea numerous times from PRC sources, but i’ve never come across the “at a relatively close distance” criterion before. Why else might they have included this? The authors repeat this “within the Spratlys” + “close together” + “intimately connected” recipe for Spratly straight baselines (and thus the scope of internal waters subject to historic title) no less than 6 times, so it’s fair to conclude this was a point they were keen to get across. That would be a tough sell domestically given that it would probably exclude James Shoal, that shallow patch of ocean considered by many (probably most) Chinese people to be the southernmost point of the nation’s sacred territory. This would be one reason to think the party might not make a Spratly baseline declaration in the near future after all. Another rambling post…i really ought to shut up and let things run their course. But the riddle of the nine-dash line continues to string me along rather compulsively. If any readers have made it this far then at least i mustn’t be the only one. The latest “leaked” video from the PLA, and its subsequent deletion from the Mainland Chinese internet, has the western China watching community grasping for explanations. Leftist battle-cry ahead of a rightist Third Plenum? Harbinger of an assertive turn in China’s US policy? A glimpse of what the PLA really thinks? My humble addition to this motley list is: powerful statement of self-importance by the CCP-PLA propaganda apparatus? The video itself is really quite a masterpiece in my view, produced by a master of political warfare, PLA National Defense University Political Commissar Liu Yazhou. It details how America is waging a smokeless war of “political genetic modification” against China, utilizing the permeation (渗透) and “peaceful evolution” strategy that brought down the Soviet Union. In case i dont make it clear enough, a lot of what I write is speculative, my aim is to try understand these things as best I can, and I would really appreciate any alternative explanations, identification of shortcomings, points of disagreement, criticisms, biases identified, etc etc. I am sure some of the interpretations I come up will turn out to be mistaken and/or incomplete, and although I hope some turn out to be right, it’s far from the end of the world if i’ve got it all wrong. It will be still have been worth the effort just to eliminate all those mistaken lines of thinking. 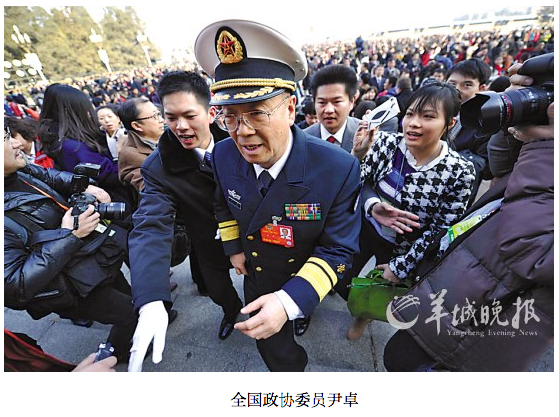 One idea i’ve been getting closer to ruling out is that Dai Xu and Luo Yuan aren’t serious PLA strategic thinkers. I think they are both propagandists and strategists. One sign is their publication in genuine journals like World Economics and Politics 《世界经济与政治》 (published by CASS), Contemporary International Relations 《现代国际关系》 (published by the MSS-affiliated CICIR), Contemporary World 《当代世界》 (CCP International Department), World Outlook 《国际展望》 (Shanghai Institute of International Relations), and Teaching and Research 《教育于研究》 (Renmin University). While they are nominated as propaganda experts, they could still spend the bulk of their time in the world of thought rather than propaganda. Even Dai Xu, whose gigantic mass media output suggests he could probably spare little time for academic work, stated in 2009 that he does both internal and external work — that is, both thought 思想 and propaganda 宣传. The difference between the two, as he said in his lecture to the PLAAF Political Academy in Shanghai, is that “in thought, anything goes, but propaganda has discipline”. This was, he said, the most important lesson he learned at the academy, his alma mater. There may be a large degree of crossover between Dai Xu Thought, and Dai Xu Propaganda — they may in fact be the same, except that the latter is presented and attenuated according to propaganda imperatives. What follows, then, is something long overdue given the amount of attention i have focused on the propaganda side of Dai Xu and Luo Yuan’s work: a partial translation of an essay that i think may come close to representing what Dai Xu really thinks, as a strategist, on the South China Sea issue. It might not be pure thought…if there was such a thing, probably the only place it could reliably be identified would be in internal-circulation articles. But People’s Tribune Frontiers 《人民论坛.学术前沿》 appears a reputable (though recently-founded) CCP journal produced by the People’s Daily group, without any attempt at mass appeal, suggesting the audience would be mainly Party members and scholars, and perhaps soldiers and policymakers too. In other words, it could conceivably be part of the “internal work” that Dai says he does — Dai Xu Thought. The article is titled ‘ “Attacking the Enemy before It is Fully Prepared”: A Petition for Changing South China Sea Strategy (“兵半渡可击”:南海战略万言书)’, and is freely available via a Hainan-based website called ‘Maritime Domain Online’ (海疆在线) that i suspect is run by the Hainan Maritime Security and Cooperation Institute that Dai Xu directs. As the title suggests, Dai makes specific policy suggestions, based on a contention that China has a rapidly-closing “window of opportunity” to “resolve” the South China Sea issue, and should therefore act sooner rather than later. Notably, however, one of these suggestions is to call for the total demilitarization of the South China Sea’s disputed areas. He advocates “intensifying economic exploitation” but also “welcoming cooperation”. He argues China should rally round the nine-dash line and avoid any involvement of UNCLOS, but he also seems to advocate negotiations. 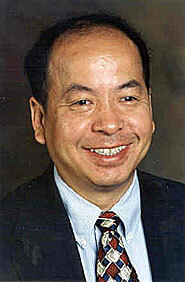 Dai’s calls for military preparations and willingness to use force to back up the assertive actions he suggests, but his emphasis is on deterrence and willpower. Big thanks to Xu Shaomin for suggesting the article. Here is the abstract, followed by a translation of the section in which Dai makes his policy suggestions with some thoughts on those policies appended, and finally a brief consideration of some implications for the explanations i’ve recently offered for the public activities of PLA “hawks” like Dai. ABSTRACT: An indisputable fact is that China is facing unprecedented challenges presented by the South China Sea issue. The said issue has been internationalized, and will soon become a focus of international politics. The South China Sea is of great significance for China’s development and security. With the development of this issue, Vietnam will rise to be China’s major concern. To successfully resolve this issue, China needs to devise a “protracted war” strategy; use the current crisis as an opportunity for a shift in military strategy; set up an interdepartmental coordination committee; and materially change its current South China Sea policy. (1.) Institute determination to resolve the issue, and commence joint preparations in all areas. At present America is not ready and has not properly armed those small countries, and external powers like Japan have not substantively entered the dispute. China must seize and occupy the strategic heights of the future, and cannot let it become the Yellow Sea again. The idea of (1) gets to the heart of the paper’s debatable but nonetheless logically defensible premise: namely, that China has a 5-10 year “window of opportunity” while the US is bogged down in the Middle East. I don’t really understand this Yellow Sea reference. (2.) Unite thinking, resolutely stick to the nine-dash line. The nine-dash line is the legal basis for China’s ownership of the Spratlys, and we absolutely cannot renounce it. We cannot make UNCLOS the main note of negotiations. The strong defence in of the nine-dashed line as “legal basis” of China’s claim in (2), and associated rejection of UNCLOS, is somewhat surprising, considering that elsewhere Dai is quite keen on transparency and clarity of intentions. Why not clarify the claim? China could continue to claim all the land features within the nine-dash line, and actually be in accordance with UNCLOS. China’s real reason for not clarifying may be that it would entail enforcement under Chinese law, which the CCP may not be keen to commit to at this point. If so, could this particular argument of Dai’s be aimed at maintaining morale, while avoiding that sort of dangerous bind? (3.) On the level of unified thinking, eliminate fear of America. Surveying US-Russian relations one can see that America respects strength. Russia halted the US [Cold War] strategic attack in Southeast Asia, and stopped the expansion of NATO beyond Ukraine and Georgia. We cannot say that [Deng/Jiang’s doctrine of] “lying low 韬光养晦” is incorrect, but China is unaware of how to “loot a burning house 趁火打劫”. China must have an awareness of global strategic games. China should participate in South American affairs, the scramble for Arctic resources, Middle East affairs, African affairs, and force the US to encircle us all around the world, “saving Zhao by besieging Wei 围魏救赵”, thus reducing the pressure on our doorstep. Increase cooperation with Russia, cooperate on the Kurils issue to draw Japan northward, and weaken US military allies. The idea of causing headaches for the US around the world to relieve the pressure on China’s periphery, as set out in (3), employs a coherent (if somewhat unhealthy when viewed from outside) strategic logic. I’m not going to pretend to know what’s best for China, but the multi-departmental group mentioned in (4) also seems to make sense. (4.) Establish a multi-departmental South China Sea coordination small group. The group would be jointly composed from the military, academia, State Oceanic Administration, Hainan Provincial Government, and the Ministry of Foreign Affairs. It should change the situation of the MFA being under stress from dealing with the complicated South China Sea situation alone. It should coordinate all the departments relevant to the South China Sea. (4) contains a clear argument for reducing the MFA’s power in South China Sea policymaking, via an indirect but unmistakable criticism of both the prominence of the Foreign Ministry’s role, and the job it is doing. Dai’s apparent perception of the MFA as dominating South China Sea policy is in stark contrast to various foreign analysts who have written of the weakness of the MFA, fragmentation in China’s foreign policymaking, especially on maritime disputes. (5.) Major adjustment must be made to South China Sea policy, prioritizing [economic] exploitation . Since diplomacy being unable to resolve the issue, and our country is unwilling to go to war lightly, all that remains is to greatly intensify economic exploitation. Our country’s South China Sea policy should be adjusted to: sovereignty is ours, intensifying exploitation, welcoming cooperation, not fearing controversy, striking against provocation. Exploitation is central. In order to reduce the concerns of the international community, China’s exploitation should proceed with the primary objective of serving the world. For example, constructing an international shipping depot, and an international tourism and sightseeing spot. To this end, a South China Sea Special Zone should be established, as a maritime screen that also performs the functions of economic national defense 经济国防. Dai’s Hainan connections keep stacking up. It seems likely that he is to some extent speaking on behalf of the Hainan Provincial Government, especially with the strong advocacy of economic development projects in (5). How novel is “economic national defense 经济国防“, meaning economic activities for national defense purposes, in the Chinese context and more broadly? (6.) Call on all countries’ militaries to withdraw from the South China Sea. Because Vietnam and the Philippines’ garrisoning of troops has affected regional shipping security, China should call for all countries to pull out their militaries simultaneously. This way, China can claim the moral high ground. Dai in (5) describes China being “unwilling” to go to war lightly as a “situation” that has left massive resource exploitation as the only option — which sounds like a (grudging?) admission that direct military action is off the policy table. 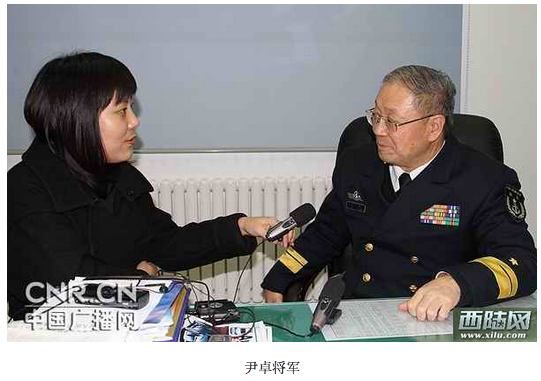 Then in (6) he actually advocates the pullout of all military forces from the area, apparently including China’s. (7.) Prepare properly for war [with Vietnam]. China should, at the appropriate time, adjust its strategic focus, and conduct far-sighted and realistic research on the South China Sea. Make every kind of war preparation in the South China Sea area, especially for war-fighting 作战 against Vietnam. As soon as conflict commences, Vietnam’s facilities must be totally destroyed, and its ports blockaded. Dai is very harsh and provocative regarding Vietnam, for example in (7). What is Dai’s problem with Vietnam? Or could it be Hainan’s problem with Vietnam? Enacting strategic containment of Vietnam is beneficial to the long-term stability of the South China Sea region, and also to improving our country’s overall security situation. While some of these arguments may be attenuated from Dai’s mass media statements, he really does appear to be attempting to pushing for policy change in the South China Sea, which at a glance spells trouble for the ‘Propaganda, Not Policy’ explanation i’ve been proposing. Yet, contrary to what some angry military enthusiasts assume, the Propaganda Not Policy argument does not necessarily imply Dai Xu doesn’t mean what he says. He may mean most or all of what he says publicly, but he only says it if and when it accords with the priorities of his superiors in the military propaganda system. Alternatively, considering the likely target audience of the People’s Tribune Frontiers, an article such as this could be aimed at the masses of cadres, officers and possibly soldiers. David Cohen discussed in the most recent China Brief how the constitutionalism debate could be intended to rally cadres to be vigilant and toe the line. It’s plausible that this has a similar intent. What’s different about this is that it has been published in a forum for genuine scholarly debate over policy, rather than a mass medium. Perhaps all that is certain about this possible piece of Dai Xu Thought, is that he was attempting to influence the Party and academic policy debate within China. Whether the ultimate aim of that was to institute the specific policy actions, or to shift the mindset of the readers — such as by raising the vigilance of cadres and perhaps soldiers — is unclear to me. What do you think? What are the other possibilities that i’m overlooking? Other notable titles that Luo and/or Dai have been published in include Party & Government Forum 《党政干部文摘》 (Shanghai and Central Party School versions), World Affairs 《世界知识》 (Ministry of Foreign Affairs), Contemporary Military Digest 《当代军事文摘》 (PLA Publishing House), Aerospace Knowledge 《航空知识》 (China Aviation Society). Found using CNKI database. I’m going to leave out the “external” from the “external propaganda expert” title, as it risks confusing the issue. Military external propaganda, as noted here, is not just about foreigners, and in fact may be overwhelmingly domestically directed, even as it serves international goals of public opinion warfare. Unless he has a team of ghost writers…?! His book publishing, however, has indeed slowed down in recent years. Can anyone enlighten me as to the People’s Tribune (Frontiers) target readership and/or purposes? Sovereignty over merely the largest two or three of the Spratlys — those with fresh water and therefore at least arguably inhabitable — would generate exclusive economic rights covering most of the area within the nine-dash line. Here is Part 2 on the PLA hawkish faction from China Brief, with added links to sources, and a couple of graphs from the utterly awesome Baidu Index (big hat tip to Kaiser Kuo). I’d also like to add my thanks to Xuan Cheng, John Garnaut, James Barker, Mark Stokes and Taylor Fravel for discussions and tips on this topic. They don’t necessarily agree with the content of the article. 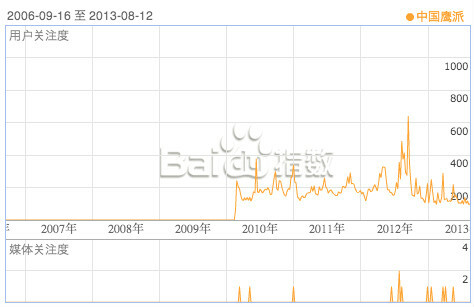 Rise of the hawks: searches for “China hawkish faction” by logged-in Baidu users since 2008. I’m requesting further info from Baidu regarding the extremely low pre-2010 numbers. One point that can be made with confidence is that user interest in the “Chinese hawkish faction” peaked during the Scarborough Shoal and (especially) Diaoyu Islands crises. If outspoken Chinese military officers are, as Part One suggested, neither irrelevant loudmouths, nor factional warriors, nor yet the voice of the People’s Liberation Army (PLA) on foreign policy, and are instead experts in the PLA-CCP propaganda system, then what might explain the bad publicity they often generate for China? This article explores how the activities of China’s military hawks may contribute to the regime’s domestic and international goals. On a general level, the very appearance of a hawkish faction—the “opera” that Luo Yuan has described—serves the domestic purposes of promoting national unity (Global Times, May 4). By amplifying threat awareness and countering perceived Western plots to permeate the psyche of the Chinese populace and army, the “hawks” direct public dissatisfaction with the policy status quo away from the system as a whole. In specific crises, such as the standoff at Scarborough Shoal last year or in the wake of the Diaoyu Islands purchase, hard-line remarks from uniformed commentators serve to rally domestic public opinion behind the prospect of military action, instil confidence in the PLA’s willingness to fight over the issue and deter China’s adversary. By amplifying the possibility of otherwise irrational Chinese military action and inevitable escalation should Beijing’s actions be interfered with, they have contributed to a thus-far successful effort to convince the Philippines and Japan to accept the new status quo around Scarborough Shoal and the Diaoyu Islands.